NYC, 04/08/2019, 7:00PM. 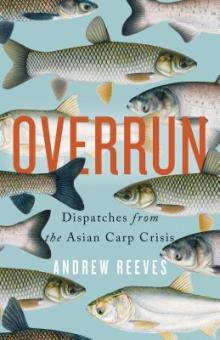 Overrun: Dispatches from the Asian Carp Crisis. Politicians, ecologists, and government wildlife officials are fighting a desperate rearguard action to halt the onward reach of Asian Carp, four troublesome fish now within a handful of miles from entering Lake Michigan. From aquaculture farms in Arkansas to the bayous of Louisiana; from marshlands in Indiana to labs in Minnesota; and from the Illinois River to the streets of Chicago where the last line of defense has been laid to keep Asian carp from reaching the Great Lakes, Overrun takes us on a firsthand journey into the heart of a crisis. Along the way, environmental journalist Andrew Reeves discovers that saving the Great Lakes is only half the challenge. The other is a radical scientific and political shift to rethink how we can bring back our degraded and ignored rivers and waterways and reconsider how we create equilibrium in a shrinking world.